1060 aluminum sheet is pretty similar to 1050 aluminum alloy with more than 0.1% of aluminum by weight. Both 1050 and 1060 aluminum sheet of Haomei Aluminum lives up to ISO standards, but they cover different ASTM standards. 1060 aluminum sheet contains 0.05% cooper, thus, its conductivity is 55%. Besides, 1060 aluminum sheet is relatively low strength, essentially pure aluminum alloy with many different tempers, such as O (annealed), H12, H14, H16, H18, etc. what’s more, other aluminum sheet belonging to commercial pure wrought family are available, including 1050, 1070, 1100 and so on. 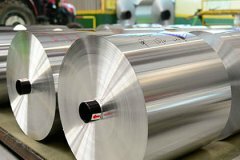 1060 aluminum sheet is noted for its excellent welding characteristics and formability by cold or hot working with commercial techniques. It cannot be hardened by heat treatment but only from cold working. Tempers H12, H14, H16 and H18 are determined by the amount of cold working imparted into the alloy. Moreover, 1060 aluminum sheet has good corrosion resistance as well as poor machine-ability, and its machine-ability can be improved in harder (cold working) tempers, such as H16 and H18. For its features above, 1060 aluminum sheet has a vast application, such as electric and chemical equipment, railroad tank cars, etc.